It's the last day of a three day weekend. I have to admit that this makes me a little sad. As much as I love school and teaching, we all need a bit of a break now and again. To cheer myself up, I'm going to blog about five good things that have happened recently. Friday, I got a set of Geometiles (affiliate link) in the mail. 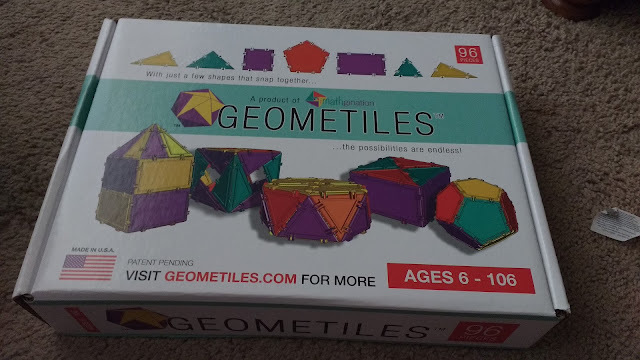 The makers of Geometiles contacted me via my blog to ask if I would be willing to write a review in exchange for a free set. Of course, I said yes! My review isn't due until October, so I've got a full month of playing ahead of me to prepare! I actually received two shipments on Friday. A month or so ago, NAEIR had Base 10 Blocks on their website for super cheap. 10 sets for $4 cheap! Even though I teach high school, I decided to invest in a set. I think these will get lots of use with my math concepts students when we review decimals later this year. 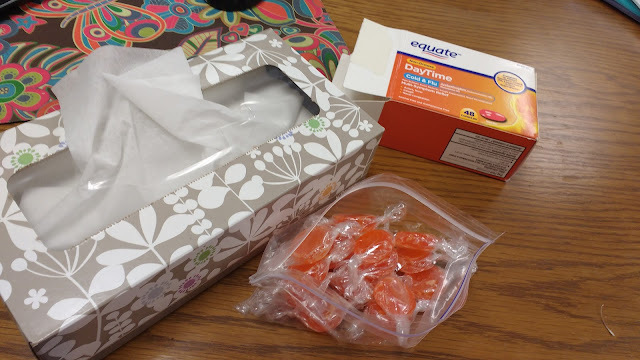 Somehow, I managed to come down with a cold during the second week of school. Usually, my immune system holds off until October to get sick. Not this year! This was a double bummer because it feels like I just got over the cold I had in July when we were in Australia. But, I'm feeling much, much better already. I've even managed to get some school work done over the weekend. Friday, I was NOT feeling well. See #3 above. You know it's obvious that you're sick when a student walks in the room and asks "Why is your nose red?" Nice to see you, too. I couldn't bear for my Algebra 1 students to get behind, so I pushed through our order of operations lesson even though I was NOT feeling it. I did give myself some grace and take it easy with my math concepts and chemistry classes. We did the Crazy Eights puzzle from School of Fisher. 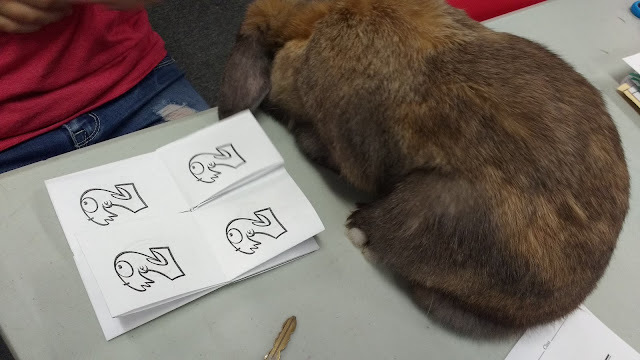 And, the biology bunny came to visit for part of the class period in chemistry. 5. ALL MY LESSONS ARE PLANNED FOR THIS WEEK! For my entire teaching career, I have been a last minute planner. This year, I'm trying to stay ahead. 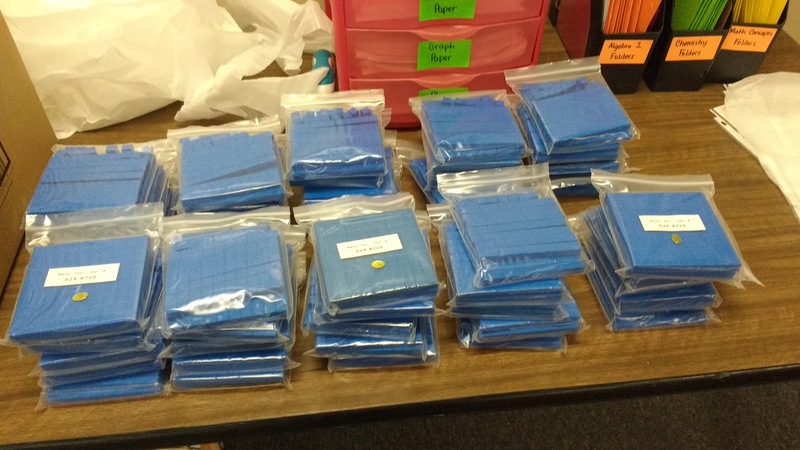 So, each weekend, I've been writing out my lesson plans for the upcoming week, creating any foldables, activities, etc., and creating my SMARTboard files for the ENTIRE week. I still have to do a bit of tweaking from day to day, but it feels so good to go to school in the morning and know that I don't have a million things to do just to get ready for the day. I'm starting to feel truly organized for the first time ever! 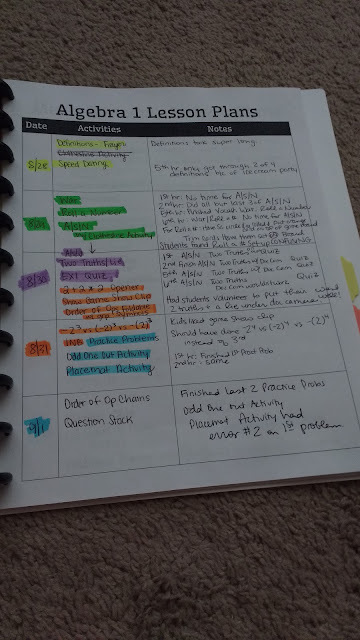 Do the highlights show what you actually accomplished on your lesson planner? Yes! Each day gets a different color. This way I can show what actually got done each day. As you probably know, things don't always go according to plans! I am so glad to hear that other experienced teachers are last minute planners! But you have mastered that and are now planning a week ahead--I was going to do that too but I keep getting analysis paralysis on the weekends and just don't plan ahead. Can you please give me some pointers on how you've accomplished it? I made a deal with myself. I would work everyday from 7:30 - 3:10 and get as much done as a I could Monday through Thursday. On Friday's I stay until I am prepared enough for Monday-Tuesday of the next week so that I can enjoy my weekends, the latest I have ever stayed is 5 because my school is done at 3:10. So far it is working. May not work for everyone. Thank you! I like that!